The courses conducted are approved by the Apex Bodies such as Medical Council of India, Dental Council of India, Central council of Indian Medicine, Central Council of Homeopathy, Indian Nursing Council, Pharmacy Council of India, All India Council of Technical Education, and University Grants Commission. The recognized courses range from undergraduate, post-graduate, fellowship, doctoral to certifications in various disciplines of Health Sciences.About 1.5 lakh students are studying in the RGUHS at any given point in time. Rajiv Gandhi University exercises superintendence and control over these 680 colleges in order to establish uniform standards par excellence in Academics and Administration of teaching and learning of Health Sciences. Besides, RGUHS directly deals with Advanced Research, Continuing Health Services Medical Education, Training of Trainers, Centers of Excellence, Technical Seminars and Conferences, to ensure that health services professionals are updated with latest developments in their respective disciplines. 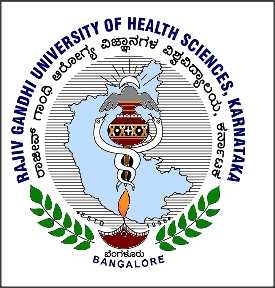 The vision of RGUHS is to be the World-class Health Services Knowledge Provider.